Basseterre, St. Kitts — The People Employment Programme (PEP) is an equal opportunity employer, and Project Manager Mr Geoffrey Hanley has said that the inclusion of a course catering for persons living with disabilities shows the diversity of the programme. Mr Hanley made the observation last week Thursday (March 13) when he, accompanied by the PEP’s Assistant Training Coordinator Mrs Diana Pemberton, visited the McKnight Community Centre in Basseterre where a group of persons living with disabilities are training in various fields including computer graphics. “It was about three weeks ago I was approached by the person who works with those persons living with disabilities, to see how PEP can partner with them and I did give a commitment to them that this is something that of course we would be more than willing to partner with,” explained Mr Hanley. According to Mr Hanley, these are persons who at one stage in life the society would have been ready to discard, but the People Employment Programme felt it was its responsibility to ensure that they too are accorded the necessary skills that they require to make them feel that they are contributing to their own growth and the growth of the nation. “We have since worked with them, assisting them in terms of their facilitation fees and the persons are now fully employed under the People Employment Programme, so they are now receiving a stipend which will be of much help to their family and even towards their lifestyles,” observed the PEP Project Manager. Volunteers who come to work with the persons with disabilities came in for high praise from Mr Hanley who added that the People Employment Programme was there to cater for everybody without ruling out anybody. He also observed that PEP was making use of community centres around the country to deliver its programmes to the people. 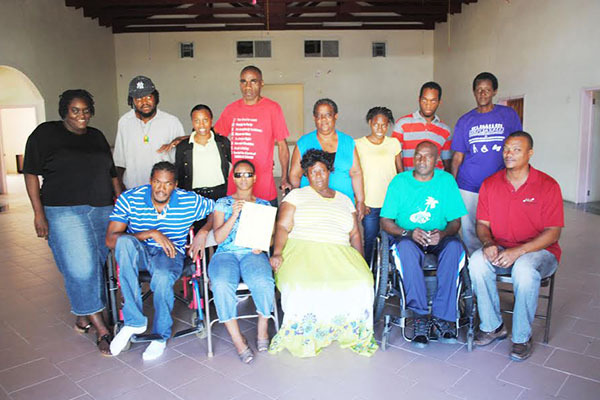 President of the St. Kitts-Nevis Association of Persons with Disabilities, Mr Anthony Mills, has welcomed the gesture by the People Employment Programme to incorporate them in the programme and is of the opinion that they too will benefit like other members of the society and has assured that they will not waste the chance given to them. “We have a training programme to teach people with disabilities, adults and young people, graphic designs and Microsoft Office, with a focus on Microsoft Word,” said Mr Mills. “We are teaching them so they could become independent, as we are also trying to teach them money management and basic life skills so as to get them prepared for independence. According to Mr Mills, the Australian High Commission gave them the computers they are using in their training, while the Sugar Industry Diversification Foundation (SIDF) will be providing them with more computers so as to expand the programme. Mr Mills further explained that of those training, a few had some rudimental knowledge of computers, but the majority are starting right from the scratch, but they are catching on very well as they are for the very first in their lives feeling that they are being empowered.